Yuan, L, H. G. Sun, Y. Zhang, and B. Q. Lu* (2018), Statistical description of depth-dependent turbulent velocity measured in Lake Taihu, China, Water Science and Engineering, doi:10.1016/j.wse.2018.09.005. Yu, X. N., Y. Zhang (corresponding author), H. G. Sun, and C. M. Zheng (2018), Time fractional derivative model with Mittag-Leffler function kernel for describing anomalous diffusion: Analytical solution in bounded-domain and model comparison, Chaos, Solitons and Fractals, 115, 306-312. Lu, B. Q. 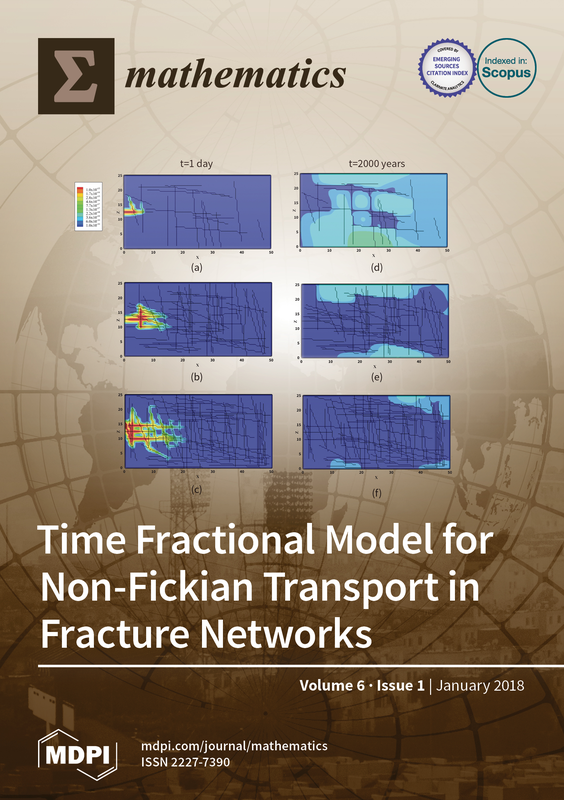 *, Y. Zhang (corresponding author), D. M. Reeves, H. G. Sun, and C. M. Zheng (2018), Application of tempered-stable time fractional-derivative model to upscale subdiffusion for pollutant transport in field-scale discrete fracture networks, Mathematics, 6(1), 5, doi:10.3390/math6010005 (cover page). Lu, B. Q. *, J. Song, S. Y. Li., G. R. Tick, W. Wei, J. T. Zhu, C. M. Zheng, and Y. Zhang (corresponding author) (2018), Quantifying transport of Arsenic in both natural soils and relatively homogeneous porous media using stochastic models, Soil Science Society of America Journal, in press. Lu, B. Q. *, Y. Zhang (corresponding author), H. G. Sun, and C. M. Zheng (2018), Lagrangian simulation of multi-step and rate-limited chemical reactions in multi-dimensional porous media, Water Science and Engineering, 11(2), 101-113. Lu, B. Q. *, Y. Zhang (corresponding author), Y. Xia, D. M. Reeves, H. G. Sun, D. B. Zhou, and C. M. Zheng (2018), Identifying non-Darcian flow and non-Fickian pressure propagation in field-scale discrete fracture networks, Journal of Geoscience and Environment Protection, 6, 59-69. Lu, B. Q. *, Y. Zhang (corresponding author), C. M. Zheng, C. T. Green, C. O’Neill, H. G. Sun, and J. Z. Qian (2018), Comparison of time nonlocal transport modes for characterizing non-Fickian transport: From mathematical interpretation to laboratory application, Water, 10, 778, doi:10.3390/w10060778. Zhang, Y., H. G. Sun, R. M. Neupauer, R. Straka, J. F. Kelly, B. Q. Lu*, and C. M. Zheng (2018), Identification of pollutant source for super-diffusion in aquifers and rivers with bounded domains, Water Resources Research, doi:10.1029/2018WR023011. Zhang, Y., G. S. Weissmann, G. E. Fogg, B. Q. Lu*, H. G. Sun, and C. M. Zheng (2018), Assessment of groundwater susceptibility to non-point source contaminants using three-dimensional transient indexes, International Journal of Environmental Research and Public Health, 15, 1177, doi:10.3390/ijerph15061177. Dawley, S.*, Y. Zhang (corresponding author), X. T. Liu, P. Jiang, L. Yuan, and H. G. Sun (2018), Statistical and probability quantification of hydrologic dynamics in the Lake Tuscaloosa Watershed, Alabama, USA, Journal of Geoscience and Environment Protection, 6, 91-100. Sun, H. G. (visiting scholar), Y. Zhang (corresponding author), S. Wei, J. T. Zhu, and W. Chen (2018), A space fractional constitutive equation model for non-Newtonian fluid flow, Communications in Nonlinear Science and Numerical Simulation, 62, 409-417. Sun, H. G. , Z. P. Li, Y. Zhang (corresponding author), and X. T. Liu (2018), Discrete fractional derivative based computational model o describe dynamics of bed-load transport, Journal of Computational and Nonlinear Dynamics, 13(6), 061004-061004-9. Sun, H. G., L. Yuan, Y. Zhang (corresponding author), and N. Privitera (undergraduate student) (2018), An investigation of stretched exponential function in quantifying long-term memory of extreme events based on artificial data following Lévy stable distribution, Complexity, Volume 2018, Article ID 5913976, 7 pages. Sun, H. G., Y. Zhang, D. Baleanu, W. Chen, and Y. Q. Chen (2018), A new collection of real world applications of fractional calculus in science and engineering, Communications in Nonlinear Science and Numerical Simulation, 64, 213-231. Jiang, L., Y. M. Li, Y. Shao, Y. Zhang, R. M. Han, S. Y. Li., and W. Wei (visiting professor) (2018), Enhanced removal of humic acid from aqueous solution by novel stabilized nano-amorphous calcium phosphate: Behaviors and Mechanisms, Applied Surface Science, 427, 965-975 (impact factor: 4.439). Li, Y. M., Y. Zhang, Y. Zhang, G. X. Wang, S. Y. Li, R. M. Han, and W. Wei (visiting professor) (2018), Reed biochar supported hydroxyapatite nanocomposite: Characterization and reactivity for methylene blue removal from aqueous media, Journal of Molecular Liquids, 263, 53-63 (impact factor: 4.513). Wang, Y., Y. Zhang, S. Y. Li., W. H. Zhong, and W. Wei (visiting professor) (2018), Enhanced methylene blue adsorption onto activated reed-derived biochar by tannic acid, Journal of Molecular Liquids, 268, 658-666 (impact factor: 4.513). Wei, S. (visiting student), W. Chen, Y. Zhang, H. Wei, and R. M. Garrard* (2018), A local radial basis function collocation method to solve the variable-order time fractional diffusion equation in a two-dimensional irregular domain, Numerical Methods for Partial Differential Equations, 34(4), 1209-1223. Wang, M., J. Z. Qian, R. M. Garrard*, Y. Zhang, and Y. Liu (2018), Flow and transport in single fracture: ADE model reexamination and velocity dependence of dispersion, Water Science and Engineering, in press. Qian, J. Z., Z. K. Wang, R. M. Garrard*, Y. Zhang, and L. Ma (2018), Non-invasive image processing method to map the spatiotemporal evolution of solute concentration in two-dimensional porous media, Journal of Hydrodynamics, 30(4), 758-761. Chang, A. L.*, H. G. Sun, C. M. Zheng, B. Q. Lu*, C. P. Lu, R. Ma, and Y. Zhang (corresponding author) (2018), A time fractional convection-diffusion equation to model gas transport through heterogeneous soil and gas reservoirs, Physica A, 502, 356-369. Zhang, Y., B. Baeumer, L. Chen, D. M. Reeves, and H. G. Sun (2017), A fully subordinated linear flow model for hillslope subsurface stormflow, Water Resources Research, 53(4), 3491-3504. Zhang, Y., H. G. Sun, B. Q. Lu*, R. Garrard, and R. M. Neupauer (2017), Identify source location and release time for pollutants undergoing super-diffusion and decay: Parameter analysis and model evaluation, Advances in Water Resources, 107, 517-524. Zhang, Y., H. G. Sun, H. H. Stowell, M. Zayernouri, and S. E. Hansen (2017), A review of applications of fractional calculus in Earth system dynamics, Chaos, Solitons and Fractals, 102, 29-46. Sun, H. G. (visiting scholar), X. T. Liu, Y. Zhang (corresponding author), G. F. Pang, and R. Garrard (2017), A fast semi-discrete Kansa method to solve the two-dimensional spatiotemporal fractional diffusion equation, Journal of Computational Physics, 345, 74-90. Sun, H. G. (visiting scholar), X. X. Hao, Y. Zhang (corresponding author), and D. Baleanu (2017), Relaxation and diffusion models with non-singular kernels, Physica A, 468, 590-596. 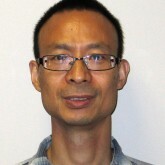 Sun, H. G. (visiting scholar), Z. P. Li, Y. Zhang (corresponding author), and W. Chen (2017), Fractional and fractal derivative models for transient anomalous diffusion: Model comparison, Chaos, Solitons and Fractals, 102, 346-353. Nie, S. Q., H. G. Sun, Y. Zhang, D. Chen, W. Chen, L. Chen, and S. Schaefer (undergraduate student) (2017), Vertical distribution of suspended sediment under steady flow: Existing theories and fractional derivative model, Discrete Dynamics in Nature and Society, volume 2017, Article ID 5481531. Li, Y. M., S. Y. Wang, Y. Zhang, S. Y. Li, W. H. Zhong, and W. Wei (2017), Enhanced tetracycline adsorption onto hydroxyapatite by Fe(III) incorporation, Journal of Molecular Liquids, 247, 171-181. Garrard, R.*, Y. Zhang (corresponding author), S. Wei, H. G. Sun, and J. Z. Qian (2017), Can a time fractional advection-dispersion equation capture scale-dependent dispersion in saturated porous media? Ground Water, 55(6), 857-870. Fogg, Graham E., and Y. Zhang (2016), Debates-Stochastic subsurface hydrology from theory to practice: A geologic perspective, Water Resources Research, 52, 9235-9245, doi:10.1002/2016WR019699. Zhang, Y., C. T. Green, E. M. LaBolle, R. M. Neupauer, and H. G. Sun (2016), Bounded fractional diffusion in geological media: Definition and Lagrangian approximation, Water Resources Research, 52, 8561-8577, doi:10.1002/2016WR019178. Zhang, Y., M. M. Meerschaert, and R. M. Neupauer (2016), Backward fractional advection dispersion model for contaminant source prediction, Water Resources Research, 52, 2462-2473, doi:10.1002/2015WR018515. Zhang, Y., D. Chen, R. Garrard (student), H. G. Sun, and Y. H. Lu (2016), Influence of bed clusters and size gradation on operational time distribution for non-uniform bed-load transport, Hydrological Processes, 30(17), 3030-3045. Zhang, Y., L. Chen, D. M. Reeves, and H. G. Sun (2016), A fractional-order tempered-stable continuity model to capture surface water runoff, Journal of Vibration and Control, 22(8), 1993-2003. Wei, W., Y. Wang, Z. Wang, R. Han, S. Li, Z. Wei, and Y. Zhang (2016), Stability of chloropyromorphite in ryegrass rhizosphere as affected by root-secreted low molecular weight organic acids, PLOS ONE, doi:10.1371/journal.pone.0160628. Green, C. T., B. C. Jurgens, Y. Zhang, J. J. Starn, M. J. Singleton, and B. K. Esser (2016), Regional oxygen reduction and denitrification rates in groundwater from multi-model residence time distributions, San Joaquin Valley, USA, Journal of Hydrology, 543, 155-166. Qian, J. Z., L. Wang, L. Ma, Y. H. Lu, W. Zhao, and Y. Zhang (2016), Multivariate statistical analysis of water chemistry in evaluating groundwater geochemical evolution and aquifer connectivity near a large coal mine, Anhui, China, Environmental Earth Sciences, 75(9):747, doi:10.1007/s12665-016-5541-5. Peng, Y., W. Wei, H. Zhou, S. Y. Ge, S. Y. Li, G. X. Wang, and Y. Zhang (2016), Iron humate as a novel adsorbent for p-Arsanilic acid removal from aqueous solution, Journal of Dispersion Science and Technology, 37(11), 1590-1598. Zhang, Y., M. M. Meerschaert, B. Baeumer, and E. M. LaBolle (2015), Modeling mixed retention and early arrivals in multidimensional heterogeneous media using an explicit Lagrangian scheme, Water Resources Research, 51, 6311-6337, doi:10.1002/2015WR016902. Sun, H. G., A. L. Chang, W. Chen, and Y. Zhang (2015), Anomalous diffusion: fractional derivative equation models and applications in environmental flows (in Chinese), Scientia Sinica – Physica, Mechanica & Astronomica, 45, 104702, doi: 10.1360/SSPMA2015-00313. Li, S. Y., J. P. Zhu, G. X. Wang, L. X. Ni, Y. Zhang, and C. T. Green (2015), Rapid removal of Nitrobenzene in a three-phase ozone loaded system with gas-liquid-liquid, Chemical Engineering Communications, 202(6), 799-805. Qian, J. Z., Y. N. Wu, Y. Zhang, Y. liu, Y. H. Lu, and Z. B. Yu (2015), Evaluating differences in transport behavior of sodium chloride and brilliant blue FCF in sand columns, Transport in Porous Media, 109, 765-779. Qian, J. Z., H. B. Zhan, Y. Zhang, P. T. Sun, and Y. Liu (2015), Numerical simulation and experimental study of bimolecular reactive transport in porous media, Transport in Porous Media, 109, 724-746. Li, S. Y., T. Mei, Y. Peng, S. Y. Ge, G. X. Wang, Y. P. Zhu, L. X. Ni, and Y. Zhang (2015), Rapid removal of Tetracycline (TC) by ozonation after extraction TC from water into acetic acid solution using granular activated carbon, Ozone: Sciences & Engineering, 37(5), 405-410. Yu, Z. B., P. Jiang, M. R. Gautam, Y. Zhang, and K. Acharya (2015), Changes of seasonal storm properties in California and Nevada from an ensemble of climate projections, Journal of Geophysical Research-Atmospheres, 120, 2676-2688, doi:10.1002/2014JD022414. Sun, H. G., D. Chen, Y. Zhang, and L. Chen (2015), Understanding partial bed-load transport: Experiments and stochastic model analysis, Journal of Hydrology, 521, 196-204. Zhang, Y., C. T. Green, and G. R. Tick (2015), Peclet number as affected by molecular diffusion controls transient anomalous transport in alluvial aquifer-aquitard complexes, Journal of Contaminant Hydrology, 177-178, 220-238. Baeumer, B., Y. Zhang, and R. Schumer (2015), Incorporating super-diffusion due to sub-grid heterogeneity to capture non-Fickian transport, Ground Water, 53(5), 699-708, doi:10.1111/gwat.12267. Zhang, Y., R. L. Martin, D. Chen, B. Baeumer, H. G. Sun, and L. Chen (2014), A subordinated advection model for uniform bedload transport from local to regional scales, Journal of Geophysical Research – Earth Surface, 119, 2711-2729, doi:10.1002/2014JF003145. Green, C. T., Y. Zhang, B. C. Jurgens, J. J. Starn, and M. K. Landon (2014), Accuracy of travel time distribution (TTD) models as affected by TTD complexity, observation errors, and model and tracer selection, Water Resources Research, 50, 6191-6213, doi:10.1002/2014WR015625. Zhang, Y., J. Z. Qian, C. Papelis, P. T. Sun, and Z. B. Yu (2014), Improved understanding of bimolecular reactions in deceptively simple homogeneous media: From laboratory experiments to Lagrangian quantification, Water Resources Research, 50, 1704-1715, doi:10.1002/2013WR014711. Zhang, Y., C. T. Green, and B. Baeumer (2014), Linking aquifer spatial properties and non-Fickian transport in alluvial settings, Journal of Hydrology, 512, 315-331. Sun, H. G.*, Y. Zhang, W. Chen, and D. M. Reeves (2014), Use of a variable-index fractional-derivative model to capture transient dispersion in heterogeneous media, Journal of Contaminant Hydrology, 157, 47-58 (2017高被引论文).